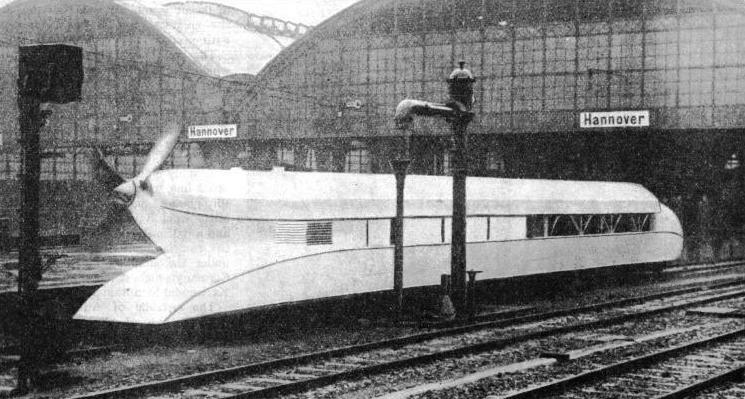 A NEW STREAMLINED STEAM LOCOMOTIVE built for the German lines and designed for speeds of 105 to 110 mph. The locomotive is of the 4-6-4 wheel arrangement, and has three cylinders, and driving wheels of 7 ft 6½-in diameter. The weight of the engine in working order is 127 tons; with the ten-wheel tender, the total weight is 212 tons. Steam is generated at 284 lb per sq in. The overall length is 85 ft 3-in. IN the chapter “Germany and Holland”, which begins on page 579, reference was made to the remarkable experiments and achievements in advanced railway working which have taken place in Germany. Many of these deserve special attention. To-day, in fact, Germany can claim to hold that reputation for applied railway science which America enjoyed before the war of 1914-18. America still carries out many interesting modernizations, but perhaps they are not so general as those in Germany, whose aim is to have the whole of her railway system as practically advanced as possible. Years of research have gone to the building up of this reputation. Germany was the earliest country to make a practical application of electric traction to railway working. As long ago as 1838, an inventor named Robert Davidson built a simple electric battery locomotive which succeeded in propelling itself at a low speed along one of the early Scottish railways; but it was not until 1879 that the world saw its first electric train, taking current from a conductor rail in the recognized manner of to-day. This pioneer electric passenger train, evolved by Siemens and Halske, carried people on a narrow-gauge line in the grounds of a Berlin exhibition. The diminutive electric locomotive was carried on four solid wheels, with the motorman sitting astride of it, in bicycle fashion. It is still in existence, and may be seen in the railway hall of the German Museum at Munich. The engine is so small that it is housed under a big glass case, as if it were a model. For all that, it worked on a perfectly genuine passenger-carrying railway, and may be claimed as the direct ancestor of the great electric locomotives of the Continental mountain lines, of the London tube trains, and of the splendid modern electric trains running between London and Brighton. England gave Germany the steam locomotive, and she responded with the electric locomotive. During the early eighteen-eighties electric traction was successfully applied to tramways, and these unobtrusive experiments went a long way towards the ultimate development of the full-size electric railway. At the beginning of the present century, however, some really spectacular experiments took place on the military railway between Marienfelde and Zossen, fourteen and a half miles long, and easily graded. In 1901-2 interesting experiments were made with an eight-wheeled double-bogie electric locomotive built by Siemens and Halske, current being supplied at 15,000 volts from the AEG (General Electricity Company) power station at Ober-schönweide. This locomotive attained a speed of 101 miles an hour, which was then a world's record for any vehicle; but she so damaged the permanent way that nothing more could be done until the rails and roadbed had been drastically consolidated. By 1903 the modifications had been carried out, and two new experimental cars appeared. Each car ran on two six-wheeled bogies, developed 1,000 hp, and carried fifty passengers. The motors of one car were built by Siemens and Halske, those of the other by the AEG, the mechanical parts and coach work coming from the firm of Van der Zypen and Charlier in both instances. On October 6, 1903, the Siemens and Halske car covered the fourteen and a half miles in eight minutes, and attained a maximum speed of 126 miles an hour. On October 23 it beat its own record by attaining 128·5 miles an hour. The final words of the argument were spoken by the rival AEG car, which reached 130·5 miles an hour. This remained the record until the much more recent experiments with the “Rail-Zeppelin” car, to which reference will shortly be made. These heavy cars, travelling at high speeds, and without streamlining, against the enormous resistance of the atmosphere, whirled up the ballast to such an extent that the sound of its impact against the undersides of the floors was similar to a continuous hum. In the rear, the displaced soil and loose stones followed the cars like miniature tornadoes. The running of the cars themselves, however, was surprisingly smooth. More than thirty years have passed, but Germany has not lost her love of high-speed trials, and to-day she operates high-speed passenger services in addition. A primitive air-screw-propelled car was tried on the Berlin-Hamburg line very shortly after the war of 1914-18. It consisted simply of an ordinary van with aeroplane engines and screws mounted at either end. Some remarkable speeds were attained, but no developments followed. But in 1931 occurred an event of importance in railway history. Dr. F. Kruckenburg invented a remarkable rail-car, built of aluminium, carried on four wheels only, scientifically streamlined, and propelled by a powerful aero engine with a single air screw at the back. Midsummer morning, this strange car set out over Germany's recognized railway race-track - the Berlin to Hamburg main line - and covered the whole of it at an average start-to-stop speed of 99·4 miles an hour, reaching a speed of over two miles a minute. The aeroplane which accompanied the car had considerable difficulty in keeping pace. This average is the present record for railway speed. THE FINAL LINK with the peak of Germany’s highest mountain is the aerial cableway that takes the traveller on the Bavarian Zugspitze Railway up 9,725 ft. 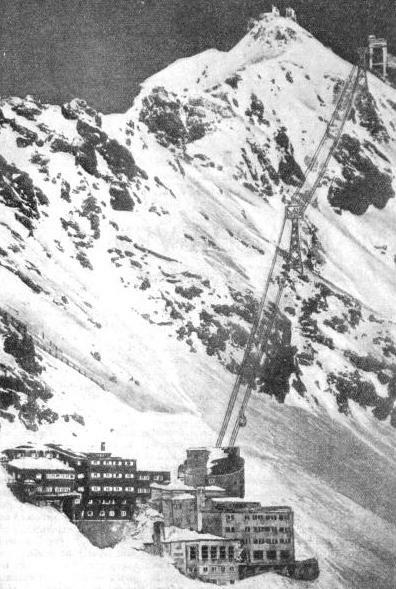 The building at the bottom of the photograph is the Schneefernerhaus Station, which is reached from below by an electric rack-and-pinion railway. The suspension section of the line has a vertical rise of nearly 1,000ft. The electric cars just described belong to the experimental and not to the practical side of German railway working. The practical side now requires attention. A start may be made with the “Flying Hamburger”, more fully described in the chapter beginning on page 173. This was the first high-speed rail-car in the world to operate a regular express service. This pioneer “lightning-train”, as the Germans have called it, was built at Görlitz in 1932, and consists of two stream-lined coach-bodies mounted on three bogies. The middle bogie supports both bodies, in the manner first introduced on the old Great Northern Railway of England by Mr. H. N. Gresley in the earlier part of this century. The end bogies carry the electric driving motors. These derive their energy from generators driven by two Maybach heavy-oil engines, each developing 410 hp, which are situated at either end of the articulated car. The inside contains second-class passenger accommodation of the most comfortable description, rivalling that in the Pullman type coaches of the steam-driven “Rheingold Express”, which runs between the Hook of Holland, Basle, and Zurich. The appearance is that of a long, open corridor carriage without partitions. The two car bodies between them provide seating accommodation for 102 persons. In one there is a luggage locker, and in the other a refreshment counter. The interior fittings arc plain but beautifully finished, and the velvet covered upholstery is designed to eliminate all corners and crevices where dust and dirt might lurk. There is one large window to each division on either side of the coach. The exterior of the car, resembling the coaches of the “Rheingold Express”, is painted in purple and cream, with gold lines; the roof has the colour of aluminium. Swiftly and quietly, day after day, the “Flying Hamburger” maintains the “extra fast” service between Germany's capital and her greatest port, without dust or cinders, and with barely any smoke save a faint blue blur from her fore and aft exhaust pipes. The success of the “Flying Hamburger” has prompted the motive-power department of the neighbouring Netherlands Railways to introduce similar cars on fast inter-city services in Holland. The Dutch cars differ from their German forerunner in that they provide accommodation for third-class passengers in leather-seated saloons. Further, each unit consists of three bodies, mounted on four bogies, the central part containing the engines and driving equipment, remotely controlled from driving compartments at either end. Their exterior aspect is perhaps less attractive than that of the famous German car, for they have a simple aluminium finish, recalling that of a British air-liner. In Germany thirteen new and improved rail-cars were introduced in the spring of 1935. The general design is similar to that of the “Flying Hamburger”; but the passenger saloons are more comfortable. Diesel rail-cars have also been put into service in many of the other European countries as well as in the USA. German rail-cars are not entirely new to that country, for ever since the war she has been experimenting with petrol, petrol-electric, and oil-electric rail-cars of various kinds, while electric cars deriving their energy from batteries are used on some lines. These earlier cars, however, were mostly built for local and branch-line traffic on routes where the full-sized steam train would not pay its way - in other words, on work similar to that which is carried out by steam rail-cars in the north of England and Scotland. The steam rail-car is found also in Germany, but on fast inter-city work. Curiously enough, too, we find this steam car in Hamburg, perhaps alongside its Diesel-electric fellow. The car in question belongs not to the German State Railway, which owns the others, but to the Lübeck-Büchen Railway Company, which works the main line between Lübeck and Hamburg. The Lübeck-Büchen steam-car train consists of two vehicles, built to the same loading gauge as the ordinary coaches, thus differing from the “Flying Hamburger”, which stands low on the track. 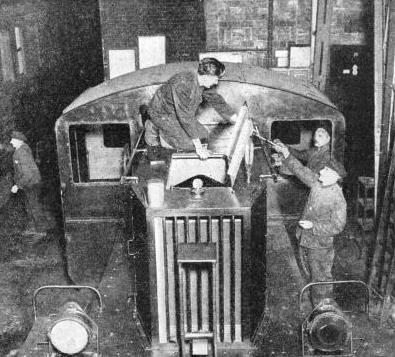 It is only partly streamlined, the wheels not being cased in, and ordinary buffers and drawgear being mounted at either end. One of the coaches contains the steam engine and motor bogie, built by the German firm of Henschel and Son, which has been producing locomotives ever since it built the old “Drache” (in English “Dragon”) locomotive in 1848. By means of remote control between the engine compartment and the other end of the unit, it can be driven from cither end with perfect ease. The train, which accommodates 130 passengers, provides a service between Hamburg and Lübeck; this is faster than any provided by the ordinary trains of the Lübeck-Büchen Railway. The distance of nearly forty miles is regularly covered in forty-nine minutes. This schedule, though far below that of the “Flying Hamburger”, is a great improvement on the old Lübeck-Büchen timings. The German State Railway operates another type of rail-car which differs from the foregoing, and from anything in Great Britain, unless we count the light electric parcels trains in the Liverpool district. This is known as the “Leig”, which is the recognized abbreviation of the German words for “light goods train”. The “Leig”, introduced in the summer of 1929, consists of a bogie parcels van propelled by a 150-hp Maybach Diesel engine, hauling one or more goods wagons. Trains of this kind now work much of the German local goods and parcels traffic. Within two years of their experimental introduction they were accounting for nine per cent of the local goods traffic of the country. A “Leig” train is far cheaper to run than a goods train drawn by an old-fashioned steam locomotive of the type usually found on local and branch lines. The rail-car itself can carry about fifteen tons of freight; with one large wagon behind there is room for the carriage of thirty-five tons at a cost rivalling that of an economical road lorry. A German “Leig” can accelerate rapidly to a speed of forty miles an hour, which is very different from the characteristic crawl of the old-fashioned branch-line goods locomotive. THE “ZEPPELIN ON WHEELS”. This rail-car, invented by Dr. Kruckenburg, reached a speed of over two miles a minute between Berlin and Hanover during experimental runs, but was never taken into regular service. The car accommodated forty passengers and was driven by a four-bladed propeller. 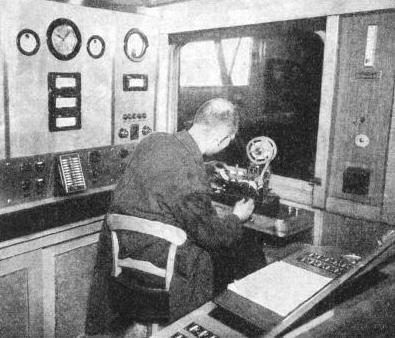 The German railways were among the earliest to introduce radio telephony on trains. This was done on the Berlin-Hamburg line in the nineteen-twenties. It is possible to deliver a telephone message from the train when it is travelling at any speed. A still more unusual arrangement has been adopted for use in shunting yards. Here the yardmaster is in control of a buzzer, or a microphone, by which he can transmit orders to the men engaged in the various parts of a big yard, and also to the enginemen. Aerials are mounted on the shunting locomotives, as shown on page 723 and following pages. Wireless control has been introduced in marshalling yards at Erfurt, Saalfeld, Halle (Saale), and Hamm on the Lorenz system, which uses the Morse code. At Pankow and Hochfeld (South), the “Telefunken” system of complete wireless telephony with loudspeakers on the locomotives is used. Another matter which has received most careful attention on the German railways is the provision of special accomm-odation for sick and injured passengers. The German State Railway has about a dozen special invalid coaches fitted out with all the accessories of a private ward in a first-rate hospital. Naturally the use of one of these is rather expensive, as not fewer than twelve first-class tickets have to be bought. For eight third-class tickets, however, a special invalid compartment may be reserved. This consists of two ordinary third class compartments with the intervening partition taken out. This double compartment contains a bed, a washable leather armchair, and a sink; a lavatory compartment adjoins it. Finally, for only two third-class tickets - his own and that of the person accompanying him - the invalid can have a portable bed made up in an ordinary compartment, so that it is accurate to say that a sick person has special accommodation without extra charge. THE “RHEINGOLD EXPRESS”, one of Germany’s most famous trains. It is composed of “Mitropa” cars painted violet and cream. The two portions of the train leave the Hook of Holland and Amsterdam and join at Utrecht. It proceeds to Emmerich, whence it runs through Cologne, Mayence, Mannheim, Carlsruhe, Baden-Baden, and Freiburg to Basle. In summer, part of the express runs on to Zurich and part to Lucerne. Although the train does not attain high speeds, it covers the route with fewer stops and in less time than any other train on the service. Although we opened this chapter with some notes on the early history of electric traction in Germany, we have yet to consider the enormous strides which main-line electrification has made in recent years. It is in Bavaria that the greatest progress has been made with electric traction on main lines. The great main line across Bavaria. which begins in Württemberg, at Stuttgart, and ends at Salzburg, in Austria, is worked by electricity over the whole of its 244 miles. The northern line, which carries the Berlin expresses, is electrically worked from Munich to Regensburg, on the Danube, a distance of roughly eighty-six miles. The Innsbruck line, which is electrically operated throughout, and includes the scenic Mittenwald Railway, has seventy-three and a half miles of its route in Bavaria, the frontier station being Mittenwald, under the shadows of the Zugspitze, Germany’s highest mountain, and of the Karwendel Mountains. The republic of Austria uses the same system of electric working as Bavaria and the main lines in other parts of Germany, namely, the single-phase system at 15,000 volts, 16⅔ cycles, with overhead conductors. It was inaugurated, in Bavaria, during the war, on the very beautiful mountain line from Freilassing to Reichenhall and Berchtesgaden. A branch line leaves the main Karwendel route south of Tützing and runs to the mountain town of Kochel, where the hydro-electric works are situated. These are described below. There is another electric. line from Munich to Innsbruck, leaving the Salzburg line at Rosenheim and crossing the Austrian frontier near the wonderful little mountain town of Kufstein, whence it connects with the capital of the Tirol by means of a junction on the main Austrian Federal Railways line at Wörgl. Both this and the Mittenwald line are among the spectacular railways of Europe. The “Karwendel Express”, running between Munich and Innsbruck and made up of Pullman type coaches, takes the Mitten-wald route, while the Berlin to Rome expresses run via Kufstein. From Murnau, between Munich and Garmisch, Bavaria’s pioneer electric railway runs up to Oberammergau. This line belongs not to the German State Railway, but to the Munich Local Railways Company, which operates a number of rural lines in Bavaria, both steam and electric, and including the picturesque Isar Valley Railway between Munich and Bichl. A single electric line runs out from Munich to Herrsching, on the beautiful Ammer Lake. This is rather in the nature of an outer suburban line, though at the week-ends it carries a considerable traffic in holiday parties and walkers. THE TERMINUS IN THE TUNNEL. The German Zugspitze Railway in Bavaria is divided into three sections, a stretch of simple adhesion working, a rack system, and an aerial cableway. The photograph shows Schneefernerhaus Station, the terminus of the rack line inside the mountain, where passengers change for the aerial railway. On short electrified lines such as this, motor coaches and trailers are used, these being attractively painted crimson below the windows, with cream coloured upper panels. On the longer distances, however, heavy electric locomotives of various kinds are in use. For the oldest line, that to Berchtesgaden, double-bogie machines were first introduced, to be followed shortly afterwards by six-coupled bogie locomotives. This was during 1914-15. For a number of years electric locomotives with coupled wheels were the rule, both in Bavaria and on the Central German lines. During 1924-25, when the first Bavarian main lines were electrified, 2-6-2 and 4-4-0 + 0-4-4 locomotives were built for passenger traffic, while articulated, 0-6-0 + 0-6-0 machines handled the heavy goods trains. 1-C-1 and a 4-4-0 + 0-4-4 becomes 2-B, B-2. Where the driving wheels are not coupled, a small “o” is placed after the indicating letter; thus a double-bogie eight-wheeler is described by the formula Bo-Bo, while a locomotive with two carrying wheels in front, two sets of four uncoupled driving wheels, and two carrying wheels behind is described as having the 1-Bo, Bo-1 wheel arrangement. The German formula is simpler than the Whyte formula, used for steam locomotives in Great Britain and America. FOR SHUNTING PURPOSES. A new type of locomotive has been evolved on the German State lines. This is a light Diesel-driven engine. It has several advantages, among which are simplicity of working and easy braking. Quick-acting brakes are essential to expeditious shunting, since the locomotive has to make innumerable stops. The Walchensee hydro-electric works, near Kochel, provide the energy for the Bavarian lines of the German State Railway. They are situated in the flanks of the mountain range called the Benediktenwand, and include two distinct power-houses. The first of these is at Obernach, beside the shores of the Walchensee. This is fed from an adit in the upper reaches of the River Isar, the fall of the water being 197 ft. In the Obernach house are situated turbo-generators developing an aggregate horse-power of 10,000. The water, after it has done its first spell of work, is discharged into the Walchensee, whence it falls again, this time 656 ft, through pipes to the much bigger power-house on the shores of another lake, the Kochelsee. The Koch-elsee house contains four 12,000 horse-power simple turbines, and four spiral turbines each developing 24,000 hp. The total power capacity of the Kochelsee alternators is 130,400 kilo-volt-amps. The Walchensee works are exceedingly impressive, and are situated in magnificent scenery. By way of comparison with these hydro-electric works, we may consider the Golpa-Zschwornewitz works in East Germany, where steam, and not water, provides the primary generative force. This contains ten steam turbine generators, with a total output of 160,000 kilowatts. Brown coal is the fuel. Other power-stations in this area are situated at Trattendorf and Lauta. The same standard rolling-stock is used in Eastern and Central Germany, on the electric lines, as in Bavaria. Central Germany saw the first main-line electrification in the country, between Bitterfeld and Dessau, which was carried out before the war. To-day the important main lines from Leipzig to Halle and to Magdeburg via Dessau are electrified throughout their length of 118 miles, the energy being obtained from the Buldenstein works, near Bitterfeld. The steam turbo-generators have an output of 16,500 kilowatts. Until comparatively recently the most modern mountain rack railway in the Bavarian Alps was that which ascends the Wendelstein, near the Austrian frontier at Kufstein, but this has been surpassed, since 1928, by the Zugspitze Railway, which ascends to the 9,725 ft summit of Germany’s highest mountain. On this line the Riggenbach type of rack is used, with electric traction, and the little blue and white train, with its connexions, brings the peak within four hours’ journey of Munich. Sky-blue and white are the national colours of Bavaria. In Munich even the trams are sky-blue. The first part of the line, without the rack, runs up the valley of the Loisach to Grainau. At Kreuzeck an aerial railway ascends one of the eastern peaks of the Wetterstein group. After Grainau, the rack rail comes into use, and the line ascends sharply past the lovely Eibsee to Riffelsee. 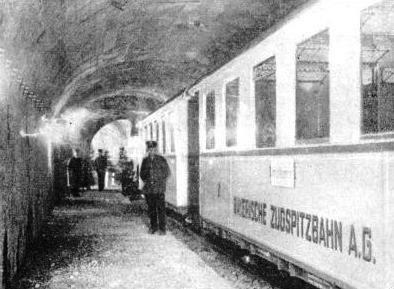 It then enters a tunnel and climbs right up through the interior of the mountain to Schneefernerhaus, the terminus of the rack line. SCIENCE AND THE RAILWAYS. On the German State Railways, locomotive testing coaches are used to make precise records of the consumption, the speeds, and the general performance of an engine. Complicated apparatus facilitates the reading of figures obtained automatically while the engine and the laboratory on wheels are running. The last section of the line, ascending roughly a thousand feet, is accomplished by means of an aerial railway, with the car hanging from wire ropes. The view from the summit is one of the most superb in Europe. Another aerial railway swings down the southern side of the mountain into Austria. This dates from 1926-7. After all these details relating to electrical enterprise in Germany, it might be thought that some other methods of traction have remained undeveloped. This is anything but true. Recently the firms of Henschel and Borsig have been making careful experiments in the construction of high speed steam locomotives, with streamlined exteriors. When the doors giving access to the working parts are closed, the locomotive has a perfectly smooth exterior, resembling that of the Diesel-electric “Flying Hamburger”. Henschel and Son are sponsoring a somewhat lighter type of steam locomotive, suited for work with short trains performing work similar to that of the “Flying Hamburger”. This design incorporates a concave “stern” to the engine, in which the “nose” of the leading coach fits like a hand in a glove. Yet another design places the driver’s cab at the front of the engine, the boiler of which is entirely closed in. There is, however, nothing new in the idea of placing the cab in front; it was applied to a number of engines on the old Italian Southern Railway about 1900.